A new “triangle of creativity” has emerged in between the intersection of Nassau Avenue, North 15th Street, and Banker Street at the Greenpoint-Williamsburg border. 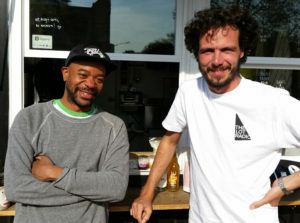 Neighborhood resident and multimedia producer Francois Vaxelaire saw the site as a perfect place for a radio station, and not too long ago, The Lot Radio was born. The Lot Radio broadcasts live on-site and streaming at www.thelotradio.com. It’s more than just a station, though. The other half of the structure houses “The Kiosk,” which sells a variety of local products to support the operations of the station. The rest of the lot is set up with chairs and benches, so the site has become a neighborhood hub for people of all kinds to come and enjoy the music, weather, food and drink, and each other’s company. Open seven days a week, you will find local workers on their breaks, mothers with strollers, DJs, young people, even priests and brothers from San Damiano Mission across the street, which has been a crucial partner for Francois and his team. “I was happy to discover Evergreen. You directed us to SBS, which is a good department who helped us out. And then Evergreen also helped me get in contact with other local businesses, which was important for me.” Francois Vaxelaire, Founder of The Lot Radio. Evergreen was able to help The Lot Radio in two ways. As Francois was going about setting up the business, we put him in touch with NYC Department of Small Business Services for guidance. Then when he was setting up the Kiosk, he was able to connect with businesses in the Evergreen network like Grady’s Cold Brew, Ovenly, Anita’s Yogurt, and Halcyon Kitchen. Other local products offered include Ceci-Cela, Dough Donuts, Bjorn Qorn, and Luft Coffee.